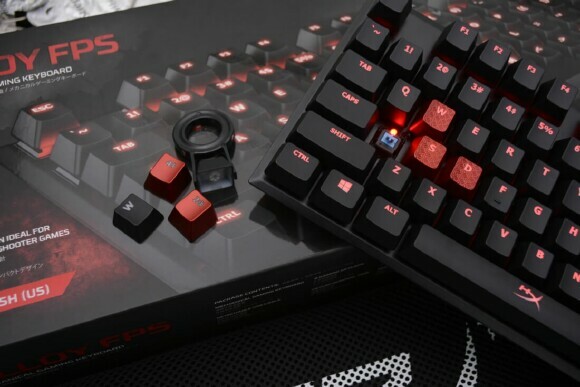 A visit to Pepcom delivers again, but this time we're in NYC; while looking around, we had an opportunity to play with HyperX Alloy FPS Mechanical Gaming Keyboard. At first look, it’s small, portable, sturdy and states, “I came here to layeth the smack down.” Now, I'm not the best gamer, just an avid one. And since my son has been mopping the floor with me in Battlefield and Call of Duty, I need all the help I can get. So, there's no better way to up my skills than to give the Alloy FPS a run. 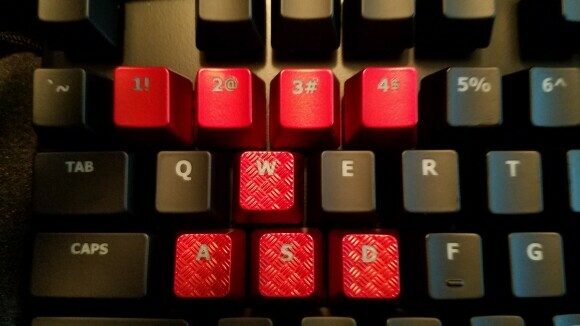 The layout for the Alloy FPS is simple; it's a black steel frame on black keys and a red under glow. Included in the package are a key removal tool and an extra set of textured red accent keys so you can find them in the dark. All keys are curved for comfort and of course, are mechanical. The one I’m testing out has a Cherry MX Red switch under each individual key with a linear operation style, which equates to a slightly quieter keypress compared to others. This red switch also has an actuation force of 45cN, which translates to the distance and resistance the key has to travel to be recognized. And precision is key since it will require less of a press to register a key. 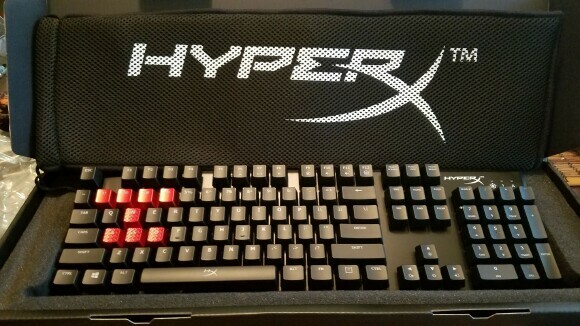 And if mechanical keyboards are your thing, you’re in luck as HyperX has even louder keyboards with two other switches - the Cherry MX Blue and Cherry MX Brown; the Brown being of tactile operation with a 45cN of actuation force and a balanced click and the Blue being the loudest of the three with a click operation style and a 50cN of actuation force. All three are available for the same price. And I could literally create a whole article alone on the differences and benefits of mechanical switches but let’s focus on this one. As I mentioned above, the design for the Alloy FPS is simple as the steel frame itself doesn’t extend much outside of the key area, making for a very compact but also heavier than the average keyboard. add in the rubber feet and this isn’t going anywhere no matter how violent you get. This brings me to travel; once you unplug the miniUSB cable it will slip right into the included heavy mesh travel pouch. 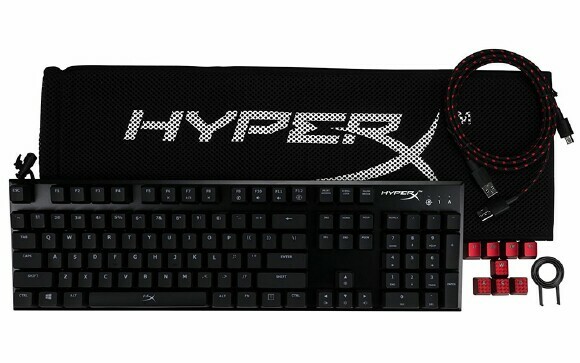 And if you’re a space saver like me, you'll also manage to fit your HyperX Fury S Mousepad in there comfortably. The HyperX Alloy FPS is designed for straight first-person play and competition; so far I've been putting in some time and getting in some side practice with C.O.D. and Battlefield 4 in between articles. Shooters weren't the only games that warranted my time with the Alloy; I tossed in some World of Warcraft, which is keyboard heavy for my playing style. And while I’m not a heavy macro user, if I do need one I can build it into the key assignments. So has my gameplay vs my ten-year-old enemy improved using the Alloy FPS? Well, I managed to kill him once but he's still mopping the floor with me. I can at least get a few shots in before death comes. And in the rush of things, even though I know where the keys are, it has come in handy to have the textured keys as it made it easier to find while I wasn’t looking. I do recommend using a wrist guard when your home or sitting up straight but that requires too much work and I’m lazy. So much can be said for HyperX in 2017. Every time I get to tinker with one of their products, I'm always in for a good time. 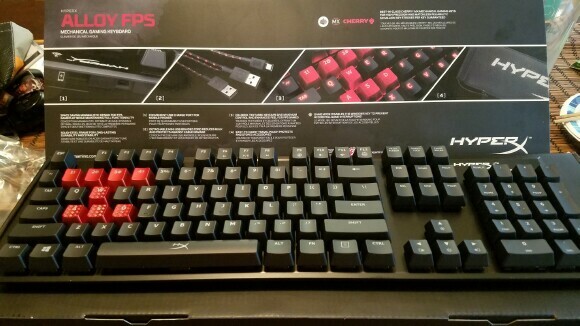 As for the Alloy FPS, I really enjoy this keyboard for what it is - a true gaming device. It keeps everything simple and in direct sight; from the moment I put fingers to keys, I felt that everything about the keyboard, from the steel frame to the Cherry MX switches, was designed with quality in mind. The weight of the device and the rubber feet ensures the keyboard stays in place. 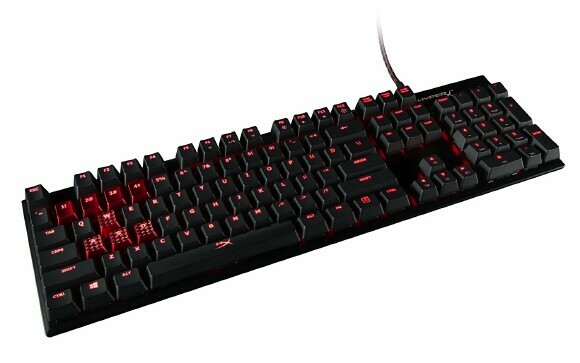 The keys are comfortable and responsive to the touch and I also enjoy the click of the Cherry MX switch. I know it’s not the loudest, but it passed the WAF (Wife Approval Factor). If traveling is a requirement this is definitely the device to have as the compact design makes it easy to carry by hand or in my personal luggage. The mesh comes with an extra pocket for wires and tic-tacs. If you are a heavy macro user or someone who likes having individual audio controls, this might not be for you. This works great for someone who enjoys FPS and mostly plays keyboard based games. It’s something to keep in mind. If FPS is your focus then purchasing a HyperX Allow FPS is money well spent and worth every cent of the $99.00 USD price tag. It has all you need to compete against the best of the best as it's well balanced and offers a very rapid response. 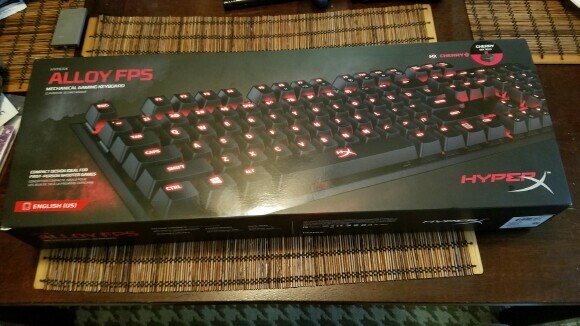 So, out of TOV 5 stars, I'm giving the HyperX Alloy FPS Mechanical Gaming Keyboard a perfect 5.